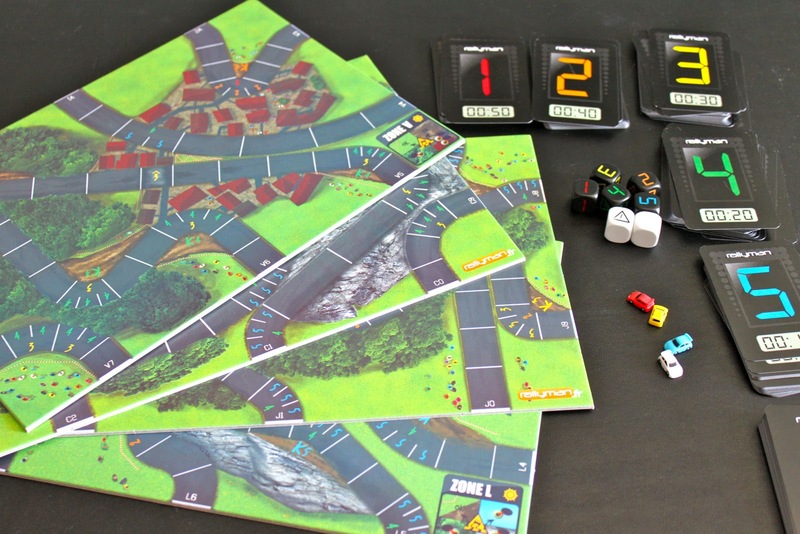 There are a lot of different themes to board games out there, but one that has always intrigued me are racing games. At first thought, it sounds ridiculous. Trying to capture the speed, adrenaline, precision, and reckless abandon of a road race on a flat board with dice, possibly on your kitchen table, seems the impossible task. Then trying to convince your friends that they want to play this with you can sometimes trump even that. But then, in most cases, the game designer comes through and delivers an awesome experience that can produce some fun and exciting gameplay. No surprise then that Rallyman is a racing game. 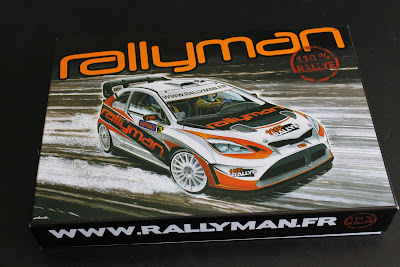 Whereas other racing games can be Formula 1 or street car racing, Rallyman is an off road racer. At the core of the game, it is a fairly straight forward "Roll the dice and go" type of game that once you cross the finish line you're done. Except, whoever makes it across the finish line first does not win, it's whoever makes it there the fastest. In the box, you'll find 4 2-sided game boards, 5 gear dice that represent what gear you are in, 2 acceleration dice that allow you to stay in a particular gear during play, 4 micro cars for players to fling around the board, and a bunch of gear cards that allow for you to keep track of what your time on the track is. 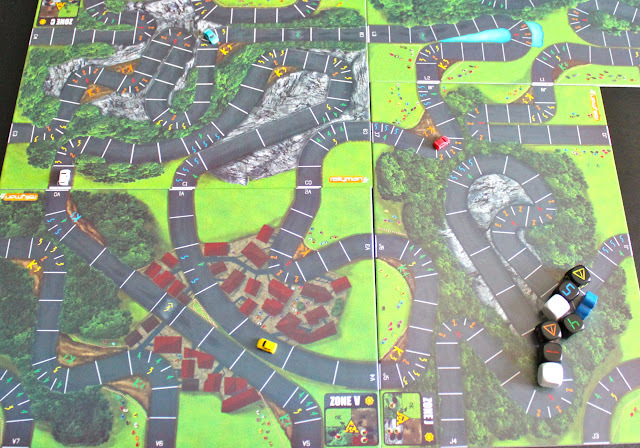 Before play begins, folk will determine what their race course will be by linking the various tracks on the game boards together. Once this is done, you are off. 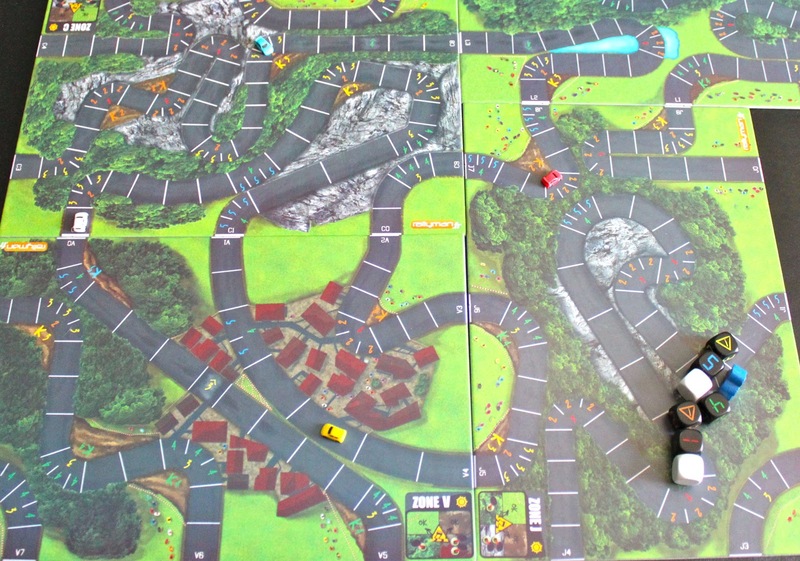 The game starts off with with players in a stagger start, meaning that player 1 will go on the first turn, followed by player 1 then player 2 on turn two, and so on. 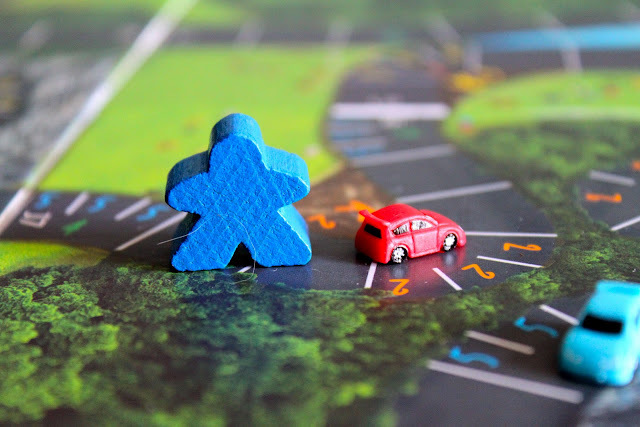 This allows for a bit more spacing on the board, and simulates an actual road rally (this also keeps the other players cars out of your way allowing you to focus on your rolls). To begin, the player will roll a gear dice to move. 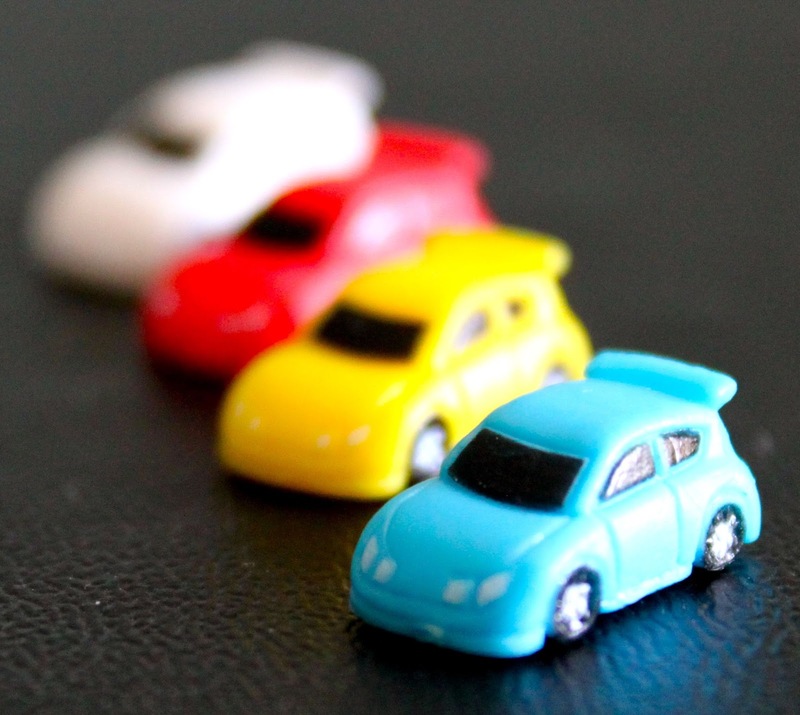 If they are at a complete stop, they will roll the 1st gear dice, otherwise, they can either roll the die for the gear they are in, or they can up or downshift and roll the appropriate gear dice. After successfully rolling, they will move one space foward, and then start to chain their gears. By chaining gears, a player can continue to roll gear dice allowing them to move along the track, but they can only roll each dice once per turn. If they started in first gear, this is a simple choice since they will want to speed up and will proceed by rolling one higher dice after another. 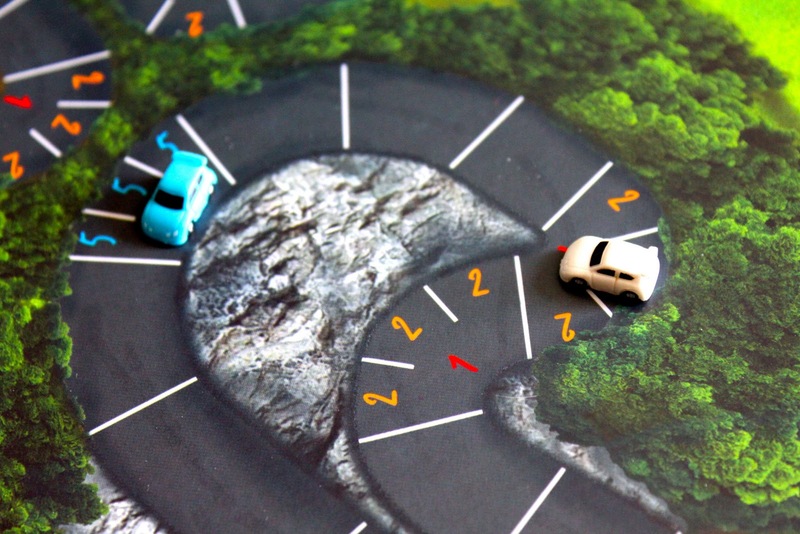 But depending on the gear they are in, and the road conditions, the player may choose to shift gears up or down so they do not loose control of their car. Optionally, they may use the white acceleration dice to maintain the gear that they are currently in. At the end of their turn, they will take a gear card and add it to their time pile, the higher the gear you end your turn on, the better your time will be. And this is where the strategy (and fun) comes into play. There are very few straightaways on the course, so you will find yourself continually upshifting to get a better time, or downshifting to make a turn and cover a greater distance. When you come to a sharp turn, you will have 2 or 3 choices to make; do I slow down and take the turn at the marked speed, take the shortcut and risk blowing a tire, or do I be awesome and stay at top speed and power slide through the turn at the cost of using more dice that I could use later? As you play and roll gears, you may end up with a <!> hazard symbol on your roll. 3 of these and your car spins out - do you chance it to get that one extra square this round, or risk getting a flat tire, increasing your overall time and eliminating a die from your pool. Gameplay is fast, and the rules are fairly simple. When your car comes to the end of the course, you take all of your gear cards and add up the times on the bottom to determine your time for the course. The driver with the lowest time wins the race. After we have played, we found ourselves discussing how we did with our driving and what we could have done to better our time, which is another beautiful thing about the game - you can continually play the same course over and over trying to better your time and get on the top of your own leader board as the fastest driver. Overall, it is a quick fun and easy game that definitely allows for lots of replay. There is an online community of drivers at Rallyman.fr, and countless course designs that you can compete on and submit your course time to see if you can make it onto the world leader boards. 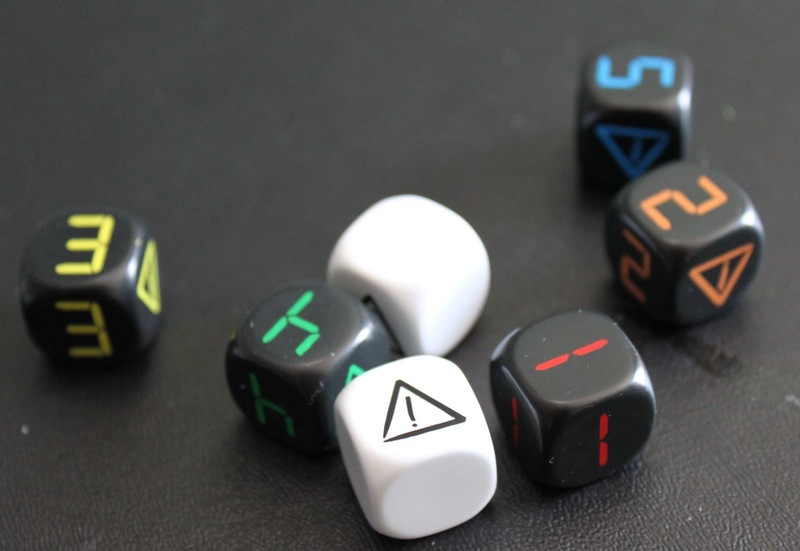 The game also comes with some additional plastic tokens to use with the advanced rules, which will reward you for playing efficiently by rolling multiple dice at the same time (as opposed to one at a time), each token shaving a second off your final time or negating at <!> hazard symbol you may roll. As far as issues with the game, the rulebook itself is a bit confusing, but that is partly due to the game being of French origin, and the translations not being that great. But if you are willing to take the time to figure it out, maybe watch a youtube demo of the game, then you are set.